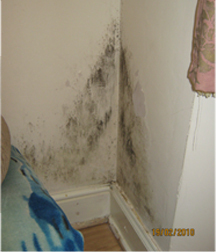 Condensation is responsible for many significant dampness problems in residential buildings and can cause issues for with mould in flats and houses. Here at Kenwood Plc, we offer a wide range of solutions for common damp issues including mould and condensation. Many properties, especially tenanted flats can suffer from condensation, resulting in black or green mould growth developing on furnishings, clothing and the walls/ceilings within the property. This can be a result poor ventilation and use of household appliances showers, kettles etc and moisture vapour from occupants. 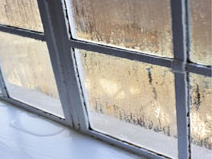 Mild cases of condensation can be alleviated by the occupants managing the moisture production, ventilation and heating. Simply covering pans when cooking, opening windows and avoiding drying clothes indoors can be helpful and can lead to a reduction in the amount of mould produced. In many cases, however, modern living styles result in an accumulation of moisture vapour within the property, which combined with poor heating and ventilation arrangements, provide the ideal conditions for mould to develop. Fortunately, Kenwood PLC are here to help with simple, yet high-quality condensation control systems to help you maintain better ventilation within the home. How Does Condensation Control Work? Our Surveyors will inspect the property to identify the cause of the problems and provide a report detailing the extent of the problem, along with our recommended solution and a quotation for any proposed works. Kenwood condensation systems are installed by our own highly trained operatives, with minimum disruption to the occupants. The installation is usually completed within one day and involves installing the appropriate condensation control unit, in conjunction with passive ventilators where specified. Preventing damage to the external fabric of the building is a key consideration to freeholders and therefore Kenwood Plc utilise low impact, specialist diamond cutting equipment, designed to prevent damage to external renders and brickwork. 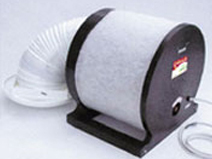 Additionally, the vents are installed using high-level dust extraction, allowing the property to remain occupied during installation and preventing dust nuisance to tenants or occupants during the installation of the condensation control systems. Once the equipment is installed, the electrical connection is made and an electrical certificate issued along with our certificate of guarantee. Our condensation control systems utilise low energy technology to ensure minimal operating costs. An improvement in air quality will be apparent immediately following the installation and after around 14 days the mould will dry to powder form which is normally removed by washing. Our installations are a cost-effective method of preventing condensation and 0% interest-free credit is available (subject to status). The Typical Kenwood Plc Systems Utilised Are Detailed Below. For single room utility areas, such as bathrooms and kitchens, Kenwood Humidivent is ideal, being a lower cost solution, whilst maintaining the effective characteristics of the Kenwood range. A Humidivent is an electronically controlled extract unit which is fully automated, ensuring a condensation-free room, without the need for user controls. Most normal bathroom extractors need to be operated by use of the light pull switch or need to be turned on / off by the occupants. This often fails to be effective as they are not operated sufficiently and are unable to sense when damp conditions are present, therefore do not prevent mould growth occurring. Kenwood Humidivents© constantly monitor the internal environment of the room and will automatically activate when excessive moisture is present. This is beneficial when showers are used or if the humidity within the room becomes excessive as the condensation control will be active and remove excess moisture vapour reducing the risk of mould growth. Where condensation is present within a bedroom or lounge environment, boost extract is undesirable and therefore the preferred solution is a Kenwood Heat Recovery ventilator©. This compact condensation control system provides an input of tempered dry air, whilst gently removing damp, moisture-laden air to the external environment. The unit is very quiet in operation and provides an excellent method of dealing with condensation. Where condensation is more widespread, the Kenwood Positive Pressure Ventilation system © is an effective solution. 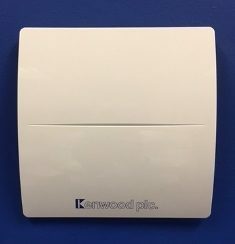 A Kenwood condensation control unit is fitted to an external wall and operates by introducing fresh, filtered air into the property. In colder weather, the automated temperature sensor activates and the unit will gently temper the incoming air to reduce heat loss. Installed in conjunction with Kenwood passive ventilators, the condensation control unit will effectively dilute and displace the damp air within the flat, ensuring a noticeable improvement in air quality and preventing mould growth occurring. This method of condensation control is especially effective in situations where the owner does not live at the property and tenants are in occupation. Our engineers will install and set up the condensation control system, following which there are no user controls, therefore ensuring the system operates efficiently without the need for any control by the occupants. The principle of introducing a supply of fresh, filtered air, whilst removing damp, moist air, via the passive ventilators elsewhere in the property, provides an excellent solution for overcoming condensation problems in residential flats ensuring a healthy living space. Kenwood positive pressure systems for houses operate on the same principle as the flats unit detailed above, however, these have the added advantage of concealing the control unit within the loft space, operating via a discreet grill installed in the ceiling, normally on the landing. How Can We Help With Condensation Control? 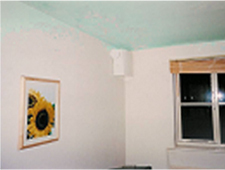 In order to provide a reliable, effective solution to such problems, especially in tenanted properties where the owner does not occupy the residence, the most effective methods of preventing condensation are to improve the air quality, by removing the damp laden air and ensuring a supply of fresh, filtered air into the property. Kenwood Plc has a range of systems for condensation control London, from simple extractor ventilators, single room solutions, incorporating heat recovery ventilators, to full positive pressure ventilation systems, which displace and dilute moisture-laden air and ensure air circulation within the property. This provides the optimum distribution point for the incoming air, and installed in conjunction with Kenwood Passive Ventilators, achieves excellent removal of damp, humid air, preventing condensation with our effective condensation control London.